One of the easiest—but most important—things you can do to control both pests and diseases in your fruit trees is to pick up all (yes ALL) the fruit that falls during the season. We call this practice “orchard hygiene”. 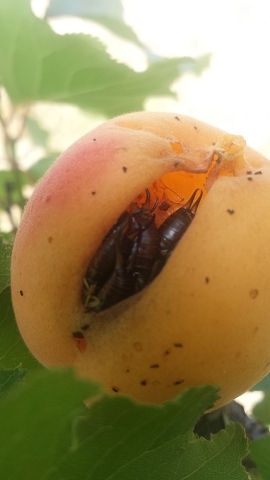 This is a common sight under the apricot trees in our orchard. Fruit that has fallen because it’s damaged by birds, or overripe, will usually develop brown rot. This is normal—fungal diseases like brown rot are incredibly useful in the ecosystem in returning organic waste to the soil. It may seem counter-intuitive to remove this great source of organic matter for the soil, and seems to go against the ‘closed loop’ principles that permaculture teaches (which we practice here on the farm as much as possible). However, we don’t want brown rot to spread to healthy fruit on the tree this year, or to infect our trees next year, so it’s important to pick the fruit up and completely remove fallen fruit from the area. Where permaculture principles come into play is what happens next. We collect ours and feed it to animals, either on the farm or nearby farms (and the farmers are always very happy to get some supplementary organic feed for their animals). Putting the fruit through a worm farm, or hot compost system will also ‘clean’ the fruit and allow the organic matter to be returned to the soil. If you want to learn more about how to use permaculture to increase the amount of food you grow, check out Permaculture in Action. 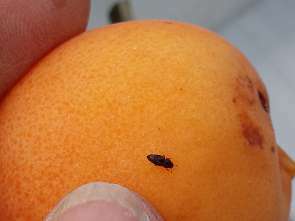 (a) carpophilus beetle – a tiny beetle that puts tiny holes in fruit, and is also a carrier of the Brown rot fungal spores. 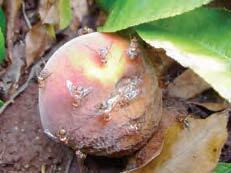 (c) Queensland fruit fly – we don’t have these in our district (yet), but it’s a terrible problem in many fruit growing areas, and relies on fruit and vegetables for its food source. 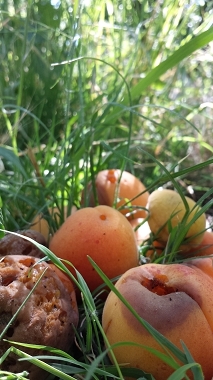 They won’t infect fallen fruit, but if they’ve already laid eggs in the fruit before it falls, the fruit on the ground provides the perfect nursery habitat for the next generation. How can one get rid of the carpophilus beetle and earwigs once they are present?? We never try to get rid of insects Ame, you’re just fighting a losing battle! We look for ways of protecting the fruit from them instead. resource to create our very own electricity with the use of generators in power plants. solar energy panels have received renewed interest among consumers. “Windfarms” or clusters of wind turbines are being used everywhere in the world. Estaba buscando esta asesoria hace mucho años en internet y no la encontraba. Estoy de acuerdo con lo que indicas. Gracias es un gran aportación. Saludos. Previous Previous post: Did you get the thinning right? Next Next post: It’s about to rain—what should I do?